Steve pointed this link out comparing the results of several different programs on the same base scene. The results are interesting among the users and programs but no matter what software is used it is only as good as the artist using the program. I replied back to a gentleman sometime back who asked which person he should hire to perform some visualization work. 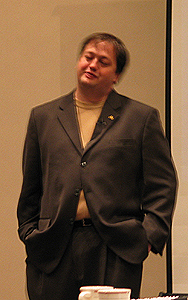 At that time he was hoping to base his decision on the software they planned to use and not their final result. For repeat customers they understand what they are getting for their time and money and we can adjust to get most any look/style they wish to achieve. It takes a few projects with clients to get to this level of understanding but it is possible. If you have used any of these people in the past then you should have a good idea of what they are capable of. For the CAD and Visualization industry there are several large conferences that you can choose from. One that I especially enjoy is Autodesk University. If you use any Autodesk product (AutoCAD, Architectural Desktop, VIZ, Inventor, Land Development Desktop, GIS, etc...) you should mark the date of November 30 - December 03, 2004 as the next AU is scheduled to be held in Las Vegas. Why do I mention this to you so early? If you would like to attend and have your companies authorization you should get started planning now. This does not need to be all the final details yet, but just an outline for getting approval. What is the process your company requires before they will allow you to attend any type of conference or training event? Information such as this will help you to plan ahead and fill in the details later and get approved to go. Having attended the past few AU's and learned a great deal I can say the cost vs. benefits ratio is one of the best out there. Not to mention having the opportunity to meet many people from all over the world and talk about things you love and enjoy as a profession. With so many classes to choose from it offers value in returning year after year to increase your skills and value to the company that you work for. For those who may not understand how to get approval from your bosses we are working on a document for you to use as a template that will be posted later this week. Look for more soon. So mark the date and start planning to attend now... I hope to see you there. Now as for who owns the wi-fi router I am borrowing access from I will have to find out later. 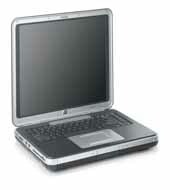 The search for a new notebook has ended and the final winner was a HP Compaq nx9110. Of course this was enhanced by purchasing a few extra bits and pieces (ram, peripherals, etc...) and this thing rocks!!! I needed additional ram to take with me on a recent trip and with the free 2-day shipping offered I should have had plenty of time, with a week to spare from ordering before I had to leave it did not arrive. Why you ask? If your shipping address does not match the credit card billing address it can take an additional week or more. This would have been nice to have known ahead of time as a large bulk of my time is spent at work and I get all my package deliveries sent there. What I recently found out is that you can have your credit card company add a secondary address to your account that will prevent this "security verification" from holding up the process. While I have never had an issue with any other companies I purchase from regularly via the web, a Crucial rep said this was their standard practice. Getting the second address added to your credit card account is as simple as a phone call and if more companies are starting to use this method then it will certainly help your packages arrive when expected. Upon returning from our Outer Banks adventure we came home late Sunday evening to find a horrible odor in the house. Unfortunately we found the source to be from one of our family pets (Ezra) having passed away while we were gone. Ezra was fully grown and found/resuced by my wife many years ago in the woods behind her dorm and has been with her since that time. We never were able to find out the age of Ezra, but they typically tend to live 20-30 years in captivity. To start this break off we had the opportunity to go to Emerald Isle, NC to attend Chico's wedding and visit with several old friends along the way. 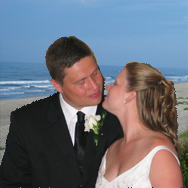 The wedding was beautiful and held right on the beach with water almost to your toes... I even had a speaking part in the ceremony. May I present and wish a wonderful congratulations to Mr. and Mrs. Brian Roberts! What a great subject, this one always gets people talking. There are many methods of modeling geometry for Architectural Visualization. If asked how many people started in this industry with modeling in AutoCAD I am sure we would see many nods, and of those how many remember the fond days of solid modeling? Modeling your geometry is the first of 3 important steps in rendering and I too started out with solid modeling. No really, I hated the changes that would occur as much as you because solid modeling with AutoCAD was very unforgiving in a project work flow. The focus of this article is what works for me as I get asked this question in numerous e-mails from many users. For the architectural industry it makes sense to use a set of tools geared with architecture in mind. I have modeled with AutoCAD, Form Z, and several other products over the years, but found a tool that not only can do production drawings (construction documents) but also with the power to do object based modeling with architecture in mind. My perfect match was a program called Architectural Desktop. ADT completely changed the way I viewed production drawings and changed my work flow. Simply put ADT uses 2d & 3d "objects", for those not familiar consider the real world example of how a door and/or window fit into a wall system. For more information on this please visit the link above and also your local users group. ADT is an amazing program and I will not sugar coat the fact that it can be complex and at times overwhelming when you start using the advanced features and designing with the Z coordinate in mind, but with persistence, some reading and a few great resources you can get it to do most anything. 1. For architectural exterior models I typically start with the building components that are known, typically this involves ADT walls, doors, windows, curtain wall and assemblies, roofs, slabs etc... The "building structure" tends to have numerous design iterations during the early design phase. With the use of a composite building model (each floor stacked on top of each other at their respective height) numerous people can work in and on specific areas of the building design. Design Note - With the release of ADT 2004 and up you should learn to use the project navigator as this keeps track of the building elements for you. 2. Because of the planned changes that occur and my software choice of VIZ/MAX, I tend to use file linking quite a bit. This works out quite well as numerous people can work on the individual sections of the composite model and I tend to just need to reload the geometry to use the changes. Even with all the powerful features of ADT, there are still areas and times that I prefer the tools from VIZ/MAX. Generally this is to add additional features or details that would be either difficult or time consuming to create in ADT. A few of the toolsets that are very useful include; lofting, scatter, shape merge. 3. At a certain point when the building has reached a “design stop” phase to continue with rendering I tend to break the link and bind the drawings into one or more .max files. From here the building design and construction documents can continue to change and update and I can just focus on the scene at this moment. From here we head towards the most critical part of rendering, these being materials and lighting. Steven Papke has put together a great comparison list of the feature sets of VIZ Render, VIZ and Max available here. If you do not yet have a free membership to the Vizdepot you will need it in order to see this article. No not me, but AUGI (Autodesk User Group International). After being hit by the Witty Worm it looks like services are slowly being restored. For those still looking for cad help via e-mail (with the closing of the guilds and the AUGI forums still down) you may want to sign-up for the cleverly named "oSNAP" mailing lists put together with help from Robert Aiken at SAUG and hosted by Frank Zander of Corbimite. What a great and busy week this has been! Polishing off a few articles that will be ready to share soon, but in the meantime I wanted to share a top notch video short film from the talented folks at Blur Studios, called Rockfish. To view the short film go the the Animation>>Shorts section.